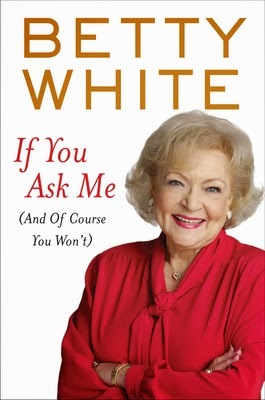 Book Jacket: "Seven-time Emmy winner Betty White's wit and wisdom take center stage as she tackles topics like friendship, romantic love, aging, television, fans, love for animals, and the brave new world of celebrity. Drawing from a lifetime of lessons learned, If You Ask Me mixes her thoughtful observations with humorous stories from a seven-decade career in Hollywood. Longtime fans and new fans alike will relish Betty's candid take on everything from the unglamorous reality behind red-carpet affairs, to her beauty regimen ('I have no idea what color my hair is, and I never intend to find out'), to the Facebook campaign that helped persuade her to host Saturday Night Live despite having turned down the hosting job three times over the course of her career. Featuring all-new material, with a focus on the past fifteen years of her life, If You Ask Me is funny, sweet, and to the point---just like Betty." Taryn's Review: When I was younger I loved watching the show Golden Girls and as an adult I love watching reruns of it. Betty White's portrayal of Rose Nylund was perfect, especially because of her wonderful comedic timing! More recently, I remembered seeing White in the Snickers commercial and laughing, but what really hooked me on Betty White was her appearance on SNL. No longer was she sweet, native Rose, but now she convict Loretta Macintosh, apartment dweller Blarfengaard Blarfengaard, and baker Florence Dusty to name a few and she owned each character. I think if you are coming into this book looking for a tell-all or a full biography, you will be disappointed. White wrote this in a style that felt like she was telling stories over coffee. None of the stories were very long, but I found myself laughing and smiling along with her words. White has a great sense of humor and I appreciated her candidness in writing about the topics she chose. There was a great tenderness as White wrote about her family and her pets; the love she has for them genuinely emanated from the pages. I joyfully breezed through this book! The book was also filled with pictures from throughout White's lifetime, which was a real treat for me. White is gorgeous, both then and now, and I loved seeing professional and private photographs shared with her fans. This was great, light-hearted read that was truly a pleasure to pick up each night before bed. If you like Betty White, definitely check out this book. If you don't know who Betty White is, acquaint yourself! Do some googling, watch a few seasons of Golden Girls, and check out her SNL episode. My parents informed me that I need to see her as Sue Ann Nivens on The Mary Tyler Moore Show and I have no doubt she was awesome in that, too! If you don't want to do any of that and just want to hear the opinions of a sassy, witty older lady, Betty White's book is perfect for you!